shop online at www.missourivalleyshopper.com 1650 Houses For Sale 1815 LOOKING TO SELL YOUR HOUSE FAST? Also, I'm looking for a house needing work. Also called a fixer upper. Write now to P.O. Box 492, Yankton, SD 57078. 1660 Acreage – Lots For Sale Prime Yankton residential property, 0.53+-ac., corner of Arlington Ave. & Applewood Dr. Great neighborhood, well drained, build ready. 605-6601375. 1705 Items $100 or Less 13-Assorted wooden window sashes, great for craft projects $5/each 605-665-7552. Craftsmans 9” buffer / polisher. New $25. Call 605-6656525. Crib set includes sheets, bumper pads, quilts, diaper holder, hamper, rug, curtain, wall hanginf for boy $45. 3 pairs maternity jeans (M-L) $5/each 605-760-0942. Electric mower $15, gas weed eater $20, hedge trimmer $10. 605-664-9539. May 15, 2018 • Page 5 Miscellaneous 1875 DIRECTV. Call & Switch Now Get NFL Sunday Ticket for FREE! Every Game. Every Sunday. CHOICE- All-Included Package. Over 185 Channels. $60/month (for 12 Months.) CALL 1- 844-245-2232 (MCN) DISH TV $59.99 For 190 Channels + $14.95 High Speed Internet. Free Installation, Smart HD DVR Included, Free Voice Remote. Some restrictions apply 1-800-732-9635 (MCN) Earthlink High Speed Internet. As Low As 14.95/month (for the first 3 months.) Reliable High Speed Fiber Optic Technology. Stream Videos, Music and More! Call Earthlink Today 1-855-679-7096 (MCN) Exede Satellite internet. Affordable, high speed broadband satellite internet anywhere in the U.S. Order now and save $100. Plans start at $39.99 /month. Call 1-800-7129365 (MCN) Paying too much for car insurance? Not sure? Want better coverage? Call now for a free quote and learn more today! 855-417-7382 (MCN) Like new 10pr-.Jeans & 10pairs capris $4/each sizes 5 to 11. TV Stand $25. Magazine rack $3. 5-baskets, nice condition $2/each. 605-660-5988 evenings. SAVE on internet and TV bundles! Order the best exclusive cable and satellite deals in your area! If eligible, get up to $300 in Visa Gift Cards. CALL NOW! 1-800-925-0146 (MCN) Metal exterior garage door, white, 32x80, comes with door handle, key and hinges $30. 605-664-9966. SAVE on internet and TV bundles! Order the best exclusive cable and satellite deals in your area! If eligible, get up to $300 in Visa Gift Cards. CALL NOW! 1-800-925-0146 (MCN) NEW Jenn Air glass top cartridge $60. HP Office Jet 4652 Printer, fax, scan, copy, web $40. 605-665-4493. Queen Sealy Posture-pedic and box spring. $75. 605-8579201. Shopping cart & high chair cover $5. Boy's 0-3 months plus shoes, full bag $20. Boy's 6-9months, some never worn, full bag $20. 605-760-0942. Sturgis Rally Harley Davidson 6 packs, 1 JR $10/each. George Foreman Mean Lean Fat Machine $25. 605-6654493. 1775 Home Furnishings Custom made furniture live edge tables. 605-665-7391. 1815 Miscellaneous A PLACE FOR MOM. The nations largest senior living referral service. Contact our trusted, local experts today! Our service is FREE/no obligation. CALL 1-855-811-8392. (MCN) Bathe safely and stay in the home you love with the #1 selling Walk-in Tub in North America. For an in-home appointment, call: 844--583-9021. (MCN) BATHROOM RENOVATIONS. EASY, ONE DAY updates! We specialize in safe bathing. Grab bars, no slip flooring & seated showers. Call for a free in-home consultation: 855-5980943 (MCN) Cross country Moving, Long distance Moving Company out of state move $799 Long Distance Movers Get Free quote on your Long distance move. 1-800-503-6126 (MCN) Spectrum Triple Play! TV, Internet & Voice for $29.99 ea. 60 MB per second speed No contract or commitment. More Channels. Faster Internet. Unlimited Voice. Call 1-855-5777502 (MCN) STEEL CULVERTS FOR SALE: New, All sizes. 605-6615050 or 605-387-5660. Ulmer Farm Service, Menno, SD. Want to purchase minerals and other oil/gas interests. Send details to: P.O. Box 13557, Denver CO 80201 (MCN) 1820 Give Aways FREE: Blonde upright piano, good condition, you haul. 605665-2267 Giveaway: Daylilys and Lily of the Valley, you dig. 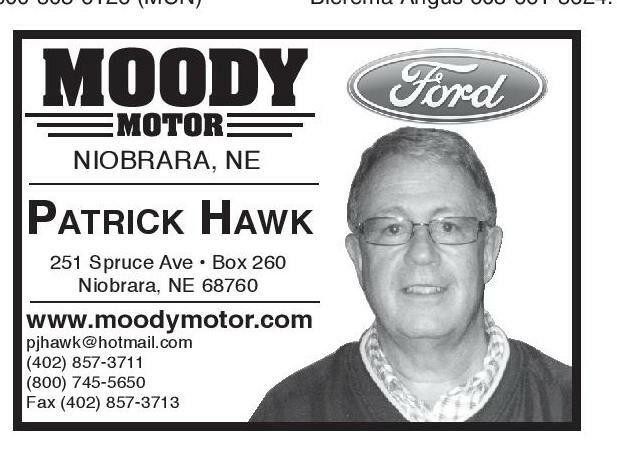 Call 605665-1016. 1850 Agriculture WE HAVE SEVERAL CREWS OF BEAN WALKERS. We do any type of farm work including cutting cedar trees. Put up fence and tear down fence. 24 years' experience. For more information call 712-943-2084, Cell 712-251-3277. 1870 Ag Equipment Strip till: Custom coulter design. Any row machines. 1015hp per row. Tills 7” wide, 24”deep at 6-9mph. 308-5500370. 1875 Livestock - Poultry 2 Year old Virgin Angus Bulls grandson of Traveler 124 & grandsons of Rido 7075. Call Bierema Angus 605-661-5624. Livestock - Poultry Brown Laying Hens $1/each. Taking order May 25-June 10. Pickup at 80407 Fish Creek Ave., Scotia, 308-245-3297 or 308-223-0082. CREOSOTE POST FOR SALE: All sizes available. Orchard, Nebraska 308-5205534. Fick Red Angus has 2 year old virgin bulls for sale. Calm & moderate, Inman, NE. Doug 402-340-99910, Ed 402-3945489. For Sale by private treaty registered Black Angus 2-year-old and yearling bulls from AI. Bred for performance, calving ease, maternal traits and docility. Call John Schieffer 605661-8531 or Marnie Schieffer 605-661-8526. Polled Hereford Bulls performance information available guaranteed breeders. Huwaldts Herefords Randolph, NE. 402-337-0784 or 402-360-4387. Poppe Bulls for Sale at Horseshoe Hill Ranch. Featuring, HHR Ten Speed E030; CED +10, BW +1.5, WW +79, YW +147, $B +174.82. To see this bull and more Angus & Sim Angus Bulls, go to poppebulls.com Jays Cell, 402-640-9031 Wanted: Pasture for 20-120 cow/calf pairs, 402-910-0606. Wanted: Pasture for 20-120 cow/calf pairs, 402-910-0606. 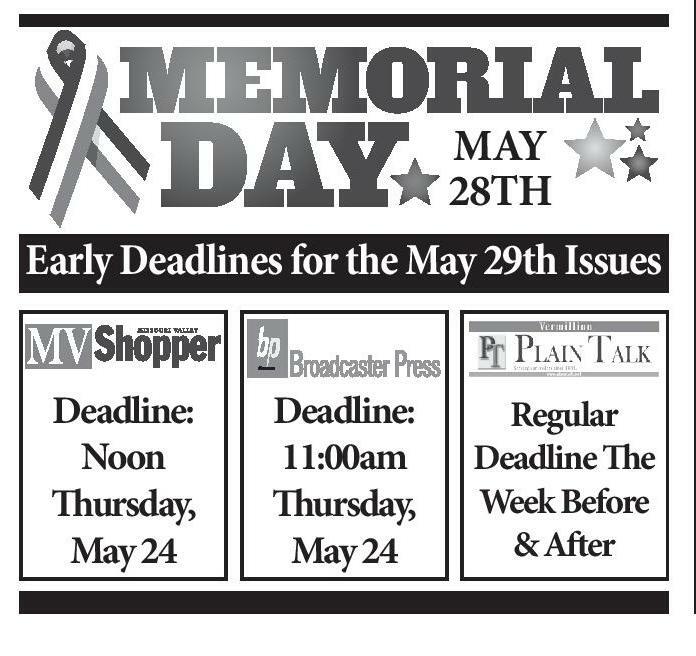 2000 Notices Business Hours of The Missouri Valley Shopper are as follows: Monday through Friday 8:00am-5:00pm. 319 Walnut St. Yankton (605)665-5884. Thank you for your continued business! Deadline is 12Noon on Fridays for the following Tuesdays MVS. THE MISSOURI VALLEY Shopper cannot verify the validity of any advertisements placed by anyone. Readers are advised to approach any advertisement with reasonable caution. Emerald Ash Borer Confirmed In South Dakota PIERRE, S.D. – The South Dakota Department of Agriculture (SDDA) has confirmed that an infestation of emerald ash borer (EAB) has been discovered in northern Sioux Falls. This is the first confirmed infestation in South Dakota. Emerald ash borer is an invasive insect that has killed tens of millions of ash trees in at least 32 states. On May 9, 2018, Secretary Mike Jaspers implemented an Emergency Plant Pest Quarantine in order to prevent or reduce the spread of the EAB. This emergency quarantine is effective immediately. The quarantine restricts the movement of ash materials in all of Minnehaha County, in areas north of Highway 18 in Lincoln County and north of Highway 18 and east of Highway 19 in Turner County, unless accompanied by the appropriate authorization from the SDDA. These regulated ash materials include: ash nursery stock; ash logs, lumber, wood chips or mulch, including trimmed ash tree branches; and pallets made out of ash. Movement of firewood from any hardwood species, whether intended for commercial or private use, is also restricted within the quarantine area. Ash trees within the quarantine area should not be pruned or removed unless absolutely necessary until after Labor Day to prevent spread of EAB. As a precautionary measure, people with ash trees in good condition within the quarantine area who want to save those trees should consider treating them now. Treatment information, as well as more information on EAB and response efforts, can be found by visiting emeraldashborerinsouthdakota.sd.gov the SDDA’s dedicated EAB webpage. 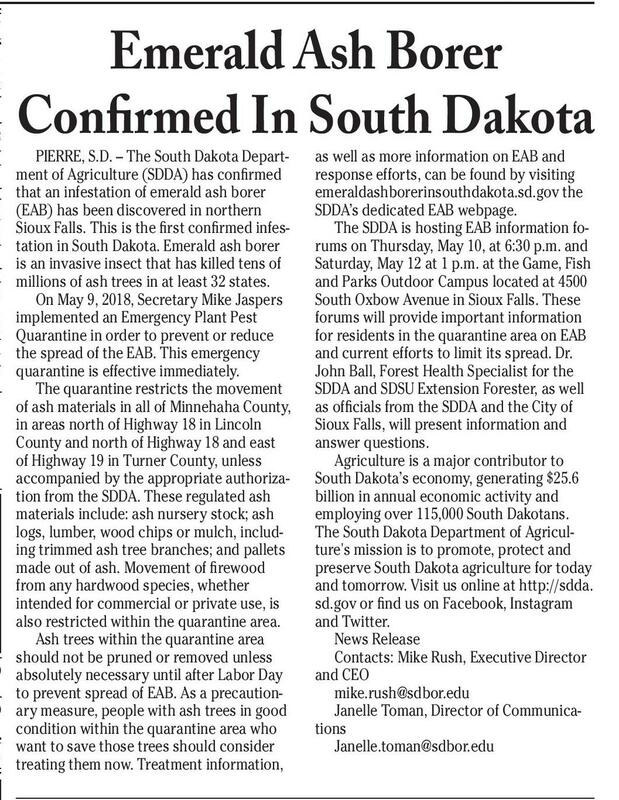 The SDDA is hosting EAB information forums on Thursday, May 10, at 6:30 p.m. and Saturday, May 12 at 1 p.m. at the Game, Fish and Parks Outdoor Campus located at 4500 South Oxbow Avenue in Sioux Falls. These forums will provide important information for residents in the quarantine area on EAB and current efforts to limit its spread. Dr. John Ball, Forest Health Specialist for the SDDA and SDSU Extension Forester, as well as officials from the SDDA and the City of Sioux Falls, will present information and answer questions. Agriculture is a major contributor to South Dakota’s economy, generating $25.6 billion in annual economic activity and employing over 115,000 South Dakotans. The South Dakota Department of Agriculture's mission is to promote, protect and preserve South Dakota agriculture for today and tomorrow. Visit us online at http://sdda. sd.gov or find us on Facebook, Instagram and Twitter. News Release Contacts: Mike Rush, Executive Director and CEO mike.rush@sdbor.edu Janelle Toman, Director of Communications Janelle.toman@sdbor.edu Graduating Student Regent Honored For Service VERMILLION, S.D. – Conrad Adam, a stuof Business at USD. 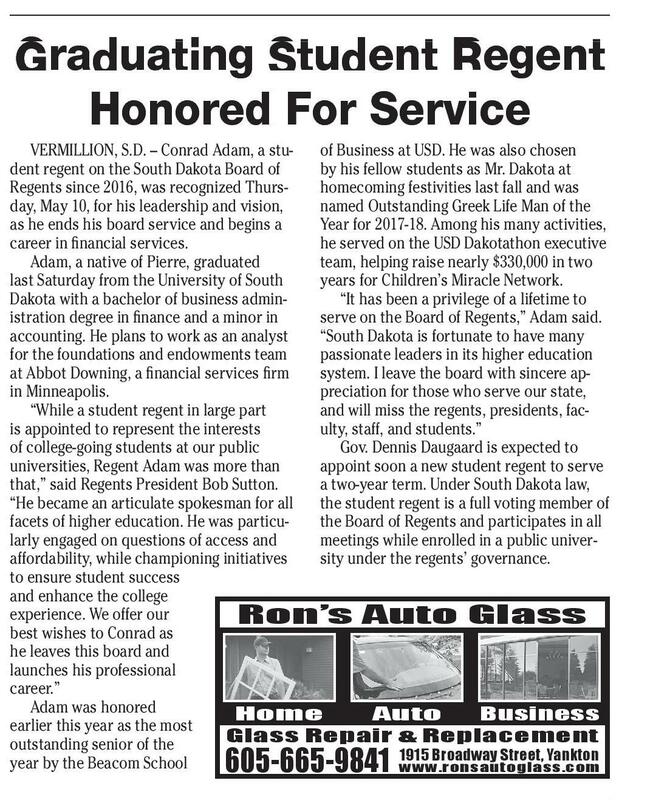 He was also chosen dent regent on the South Dakota Board of by his fellow students as Mr. Dakota at Regents since 2016, was recognized Thurshomecoming festivities last fall and was day, May 10, for his leadership and vision, named Outstanding Greek Life Man of the as he ends his board service and begins a Year for 2017-18. Among his many activities, career in financial services. he served on the USD Dakotathon executive Adam, a native of Pierre, graduated team, helping raise nearly $330,000 in two last Saturday from the University of South years for Children’s Miracle Network. Dakota with a bachelor of business admin“It has been a privilege of a lifetime to istration degree in finance and a minor in serve on the Board of Regents,” Adam said. accounting. He plans to work as an analyst “South Dakota is fortunate to have many for the foundations and endowments team passionate leaders in its higher education at Abbot Downing, a financial services firm system. I leave the board with sincere apin Minneapolis. preciation for those who serve our state, “While a student regent in large part and will miss the regents, presidents, facis appointed to represent the interests ulty, staff, and students.” of college-going students at our public Gov. Dennis Daugaard is expected to universities, Regent Adam was more than appoint soon a new student regent to serve that,” said Regents President Bob Sutton. a two-year term. Under South Dakota law, “He became an articulate spokesman for all the student regent is a full voting member of facets of higher education. He was particuthe Board of Regents and participates in all larly engaged on questions of access and meetings while enrolled in a public univeraffordability, while championing initiatives sity under the regents’ governance. to ensure student success and enhance the college experience. We offer our Ron’s Auto Glass best wishes to Conrad as he leaves this board and launches his professional career.” Adam was honored Home Auto Business earlier this year as the most Glass Repair & Replacement outstanding senior of the 1915 Broadway Street, Yankton year by the Beacom School www.ronsautoglass.com 605-665-9841 MOODY MOTOR NIOBRARA, NE Patrick Hawk 251 Spruce Ave • Box 260 Niobrara, NE 68760 www.moodymotor.com YOU CAN’T TEST DRIVE JOHN DEERE EQUIPMENT ONLINE. pjhawk@hotmail.com (402) 857-3711 (800) 745-5650 Fax (402) 857-3713 Now Hiring MILL MAINTENANCE/MECHANIC Mill Maintenance position with experience in grain handling equipment, welding, electrical, plumbing and routine maintenance. 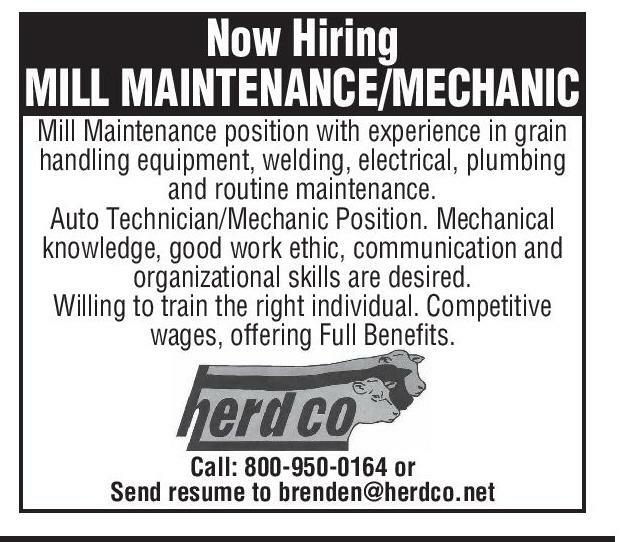 Auto Technician/Mechanic Position. Mechanical knowledge, good work ethic, communication and organizational skills are desired. Willing to train the right individual. Competitive wages, offering Full Benefits. BUT YOU CAN AT DRIVE GREEN DEMO DAYS. 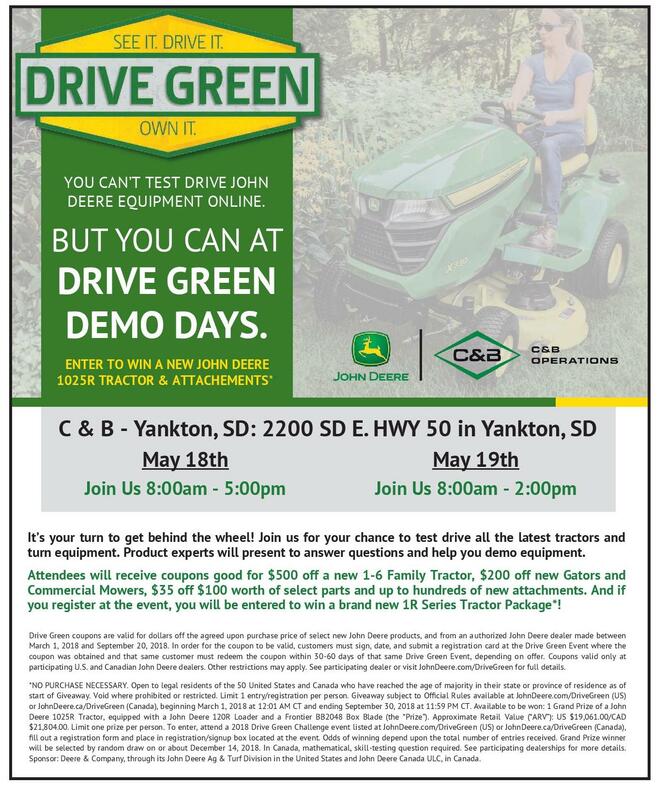 ENTER TO WIN A NEW JOHN DEERE 1025R TRACTOR & ATTACHEMENTS** C & B - Yankton, SD: 2200 SD E. HWY 50 in Yankton, SD MAY 28TH Early Deadlines for the May 29th Issues Deadline: Noon Thursday, May 24 Deadline: 11:00am Thursday, May 24 Regular Deadline The Week Before & After May 18th May 19th Join Us 8:00am - 5:00pm Call: 800-950-0164 or Send resume to brenden@herdco.net Join Us 8:00am - 2:00pm It’s your turn to get behind the wheel! Join us for your chance to test drive all the latest tractors and turn equipment. Product experts will present to answer questions and help you demo equipment. Attendees will receive coupons good for $500 off a new 1-6 Family Tractor, $200 off new Gators and Commercial Mowers, $35 off $100 worth of select parts and up to hundreds of new attachments. And if you register at the event, you will be entered to win a brand new 1R Series Tractor Package*! Drive Green coupons are valid for dollars off the agreed upon purchase price of select new John Deere products, and from an authorized John Deere dealer made between March 1, 2018 and September 20, 2018. In order for the coupon to be valid, customers must sign, date, and submit a registration card at the Drive Green Event where the coupon was obtained and that same customer must redeem the coupon within 30-60 days of that same Drive Green Event, depending on offer. Coupons valid only at participating U.S. and Canadian John Deere dealers. Other restrictions may apply. See participating dealer or visit JohnDeere.com/DriveGreen for full details. *NO PURCHASE NECESSARY. Open to legal residents of the 50 United States and Canada who have reached the age of majority in their state or province of residence as of start of Giveaway. Void where prohibited or restricted. Limit 1 entry/registration per person. Giveaway subject to Official Rules available at JohnDeere.com/DriveGreen (US) or JohnDeere.ca/DriveGreen (Canada), beginning March 1, 2018 at 12:01 AM CT and ending September 30, 2018 at 11:59 PM CT. Available to be won: 1 Grand Prize of a John Deere 1025R Tractor, equipped with a John Deere 120R Loader and a Frontier BB2048 Box Blade (the “Prize”). Approximate Retail Value (“ARV”): US $19,061.00/CAD $21,804.00. Limit one prize per person. To enter, attend a 2018 Drive Green Challenge event listed at JohnDeere.com/DriveGreen (US) or JohnDeere.ca/DriveGreen (Canada), fill out a registration form and place in registration/signup box located at the event. Odds of winning depend upon the total number of entries received. Grand Prize winner will be selected by random draw on or about December 14, 2018. In Canada, mathematical, skill-testing question required. See participating dealerships for more details. Sponsor: Deere & Company, through its John Deere Ag & Turf Division in the United States and John Deere Canada ULC, in Canada.